Drones and drone technology has, and continues, to revolutionise many industries. And now we can add farming to the list of industries in which drones are making life easier. Drones are changing the way farmers work, saving them time and helping to improve the quality and size of yields. As the human population continues to expand, so too will food consumption, and adopting new technology will become crucial in keeping the world fed. Drones give the ability to interpret where there are diseased crops, unhealthy areas in the paddock or where weed outbreaks are happening – while having this information relayed back in real time. It’s empowering smart and timely decisions when it comes to crop management. Do Farmers Need a RePL or ReOC? CASA has specific rules for flying over your own land, specifically if you’re flying a drone over your own land and not being paid for it. 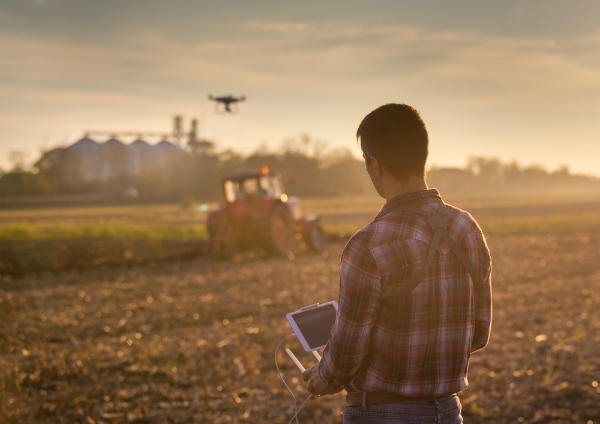 The rules are based on the weight of drones, but the good news for farmers is that flying a remotely-piloted drone up to 25kg on private land does not need require an operating certificate. This should hopefully see the expansion of drone technology on farms across Australia. If you would like to fly a larger drone, why not consider taking a RePL (Remote Pilot Licence) course or REOC (Remote Operator’s Certificate) with Total RPA. We run drone courses Australia wide as well as a range of training and consulting packages. Talk to us today about getting your business airborne.